In America homophones are language oddities that spark interest only as intellectual curiosities. But in Chinese culture they play a very large role in everyday and holiday symbols. Perhaps this is because there are so many homophones in the Chinese language. So it is that many food traditions during Chinese New Year are connected to play on homophones. 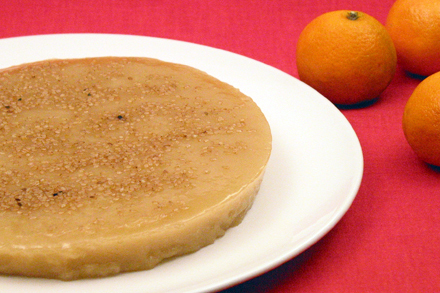 One such food symbol is the Chinese New Year cake known as “nian gao” (年糕) in Mandarin. To understand the significance of “nian gao” one must first understand the characters involved. The Chinese characters for sticky (黏) and year (年) are both pronounced as “nian.” Hence “nian gao” can refer to “sticky cake” (黏糕) or “New Year cake” (年糕) depending on the character used. Furthermore the characters for cake (糕) and high (高) are both pronounced as “gao.” Now consider the expression of “nian nian gao” (年年高), which literally means “year, year high” and is commonly used to describe “prosperity every year.” You can see why these homophones are irresistible for the Chinese to use “New Year cake” as a symbol for prosperity. This is how many sticky food items came to be known as New Year cakes. Just like many Chinese dishes, New Year cakes developed regional variations over time. But two main types of sticky cakes are common: plain and sweet. The plain New Year cake is popular around the Yangtze River delta region. It is made into a hard dry cake then sliced into thin pieces like pasta before being stir-fried with meat and vegetables, or made into soup. The sweet variety on the other hand is consumed all over the country. They are generally made with white sugar in the north and brown sugar in the south. To create the stickiness all New Year cakes are made with glutinous rice flour as the main ingredient. Although sometime regular rice flour is added to reduce the stickiness. I like mine sticky so I usually only use glutinous rice flour. The recipe I want to share with you today is for a sweet New Year cake with brown sugar. I like to use Chinese brown sugar that is like rock sugar. It has a very pleasant slightly caramelized flavor. However, you can always substitute regular brown sugar. The sweet New Year cake is almost always served fried in a light egg batter, making it slightly crunchy on the outside and very sticky inside. I’d suggest serving it with a cup of good hot Chinese tea to help counteract the stickiness. Happy New Year! 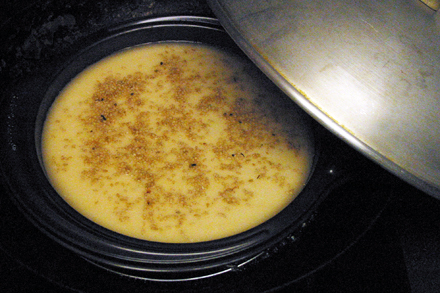 Melt brown sugar completely in the water over low heat. Put the glutinous rice flour in a medium mixing bowl. 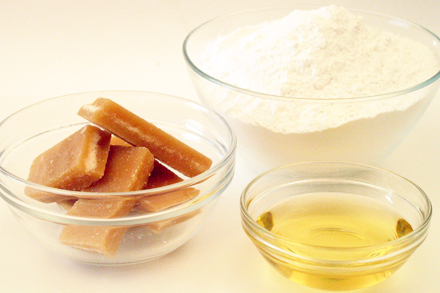 Pour the hot syrup onto the flour and partially cook it to form a dough. Add vegetable oil to the dough when it is cool to touch and knead well. The dough will be elastic and can be formed into a cake. Line the bottom of a 9-inch cake tin with waxed paper. Grease the paper and the side of the tin liberally with vegetable oil. Put the glutinous rice dough into the cake tin. Steam the cake on a rack over boiling water in a wok or in a metal steamer. Steam for about one hour. Remove the cake tin from the wok when the cake is done and sprinkle on some toasted sesame seeds. Cool on a rack till room temperature. Refrigerate the cake for about an hour before trying to unmold. This will make the process easier. When unmolding the cake you may want to grease the entire cake surface with vegetable oil so the cake will not stick to your hands. When cooled keep the cake in the refrigerator. This cake is usually covered in egg batter and deep-fried before serving. Slice the cake into about quarter inch thick slices. Make an egg batter by mixing one egg and one teaspoon of cornstarch. Dip the cake slices in the egg batter and fry the cake in a frying pan with about 1/8 inch deep of vegetable oil. Drain the fried cake on paper towel before serving. Thank you so much for this! Hope you have a happy and wonderful new year! Very interesting about the homonyms. This cake looks and sounds delicious; crunchy and sticky? mmm! This version used to be available in Canada during Chinese New Year, but I have never been able to find it in Sichuan (maybe I should go out and look again today!) Had no idea it was so easy to make, thanks! We usually just fried it in oil. As Chinese as I am, I never did like the nian gao because of its stickiness. Only occasionally will I try the deep fried ones. Still, great recipe. Thanks for this little lesson, I enjoyed it very much. And my language-nut of a boyfriend loved it too. Happy New Year! A happy Chinese new year to you! Never tried this, but would love to. Pepper, This cake is easy to make at home now with the availability of glutinous rice flour. I remember our family servant used to mill the glutinous rice in the stone mill at home. Then collect the slurry to make the cake. Those were the times when making this cake was very time consuming. Happy ‘Niu’ Year! It is my first visit to your blog and have already bookmarked it. 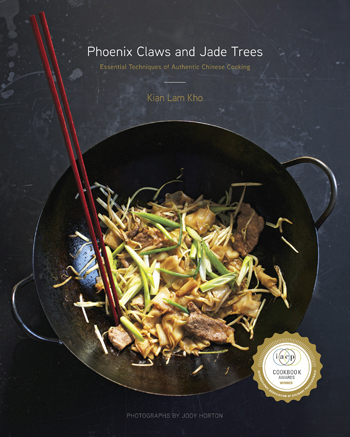 I am most excited to find a blog by a trained chef on traditional Chinese dishes using ingredients in America. I’m looking forward to learning lots from your blog! Once my mother made such a sticky new year cake that it would not set up. We wound chunks of it on chopsticks and ate it like fair food on a stick. Where do you get your glutinous flour? I’m in NYC as well. Tina, you can get glutinous rice flour in most grocery stores in Chinatown. Look in the flour/starch section of a dry goods store. An aunt of mine used to make a steamed cake that was a light creamy yellow in color and steamed in layers so you could peel off the layers when you ate it. It’s similar to the nian gao, but was for any ordinary day, not for a special occasion. I wish I knew how to make that. Anyone familiar with anything like that? Kian – thanks for the blog. I’ve been trying to find out how to make some of my childhood favorites, and it looks like you’re the answer. Hi, I wonder if you also have a recipe for making pumpkin nian gao? Can you please share with me. Tks! I do not have a pumpkin nian gao recipe handy at the moment. I’ve been planning a pumpkin cake (nan gua bing) recipe post and hope to complete soon. Cynthia are you talking about kueh lapis or the Indonesian kueh which is yellow and looks like ththe inside of a grapefruit? The one you talked about is called: “9th Layers Cake” 『九層糕』and the ingredients are rice noodles, 『澄麵粉 』, Chinese brown sugar and with red dates or sesames on the top of the last layer. You still can buy it at some old traditional bakery stores in Chinatown all year round. As far as I know, there’s one on Grand Street, between Bowery and Chystie Streets; the other one is on Mott Street, close to Pell Street. However, they all only make them as 7th layers instead 9th layers because it takes more time to finish one cake. It’s also one of the “Nian Gao” 『年糕』for the Chinese New year. My mother makes many kinds of “Nian Gao” in the New Year Eve, such as the general one for both southern and northern part of Chinese which mentioned by Kian; “9th Layers Cake”『九層糕』; “Radish (Turnip) Cake”『蘿蔔糕』and others. She also makes them when she likes to eat or when we requested. They are not hard to make, but only the “9th Layers Cake” needs time and patient to finish each layer. These are the Cantonese ( in fact, it should be called Toishanese) style New Year cakes “nian gao”. Toishan (台山) is one of the city of GuangDong (廣東省 Canton). I was looking for a recipe on the mountain yam, and by chance came to discover your blog..it is pretty interesting and I am enjoying reading it. Yeah, I miss this nian gao so much. The last time I ate this nian gao was 13 over years ago, before moving down to Birmingham, Alabama. My mum do not make this nian gao herself, but she will buy it in the wet market and then during the CNY time, she will deep fry it coated with egg batter. It is Cantonese style, and I am also a Singaporean. BTW, do u know where I could buy a pandan plant that I could repotting it into my yard. Thanks. Thank you for your kind words about Red Cook. I am very pleased to be able to share my joy of cooking with fellow Chinese food enthusiasts. As for pandan leaves I’m afraid I can help you with finding a source for the plant. I presume one would have to smuggle in the plant from SE Asia, but that’s not a very good idea since one could unknowingly transport pest across borders. We are able to get frozen pandan in SE Asian market in Chinatown here in NYC.